I have known Ryan Heaton, owner of the Valley Senior Froggys since about 1973 when he and I played trumpet at Bowdish Junior High. I was a consistent third or fourth chair below Renny Smith and Teresa Tsalaky while Ryan, who was a year younger, normally sat far below. Everyone hated those surprise tryouts that publicly and painfully exposed our lack of musical talent and lazy practicing habits. Anything could happen. More than once I sat at the bottom after a humiliating attempt, only to look up the line to see Ryan beaming back down at me from my old chair after he had pulled off an unusually good performance. Even on his best trumpet days, I would not have put him on my most-likely-to-succeed list. It was not until high school when he began bussing tables at the Valley Red Lion that it became apparent that he possessed first-chair talent in the hospitality field . One year out of high school at age 19, he was managing The 1881 Room at the Sheraton Hotel downtown. Back then Patsy Clark’s was their main competition, today it would be Churchill’s or Spencer’s, which is at the 1881 Room’s former location. After problems developed with a new general manager, Ryan thought he could do better and so applied for the manager position when it came open at the neighboring Casablanca restaurant, owned by the Omni Corporation. They liked the looks of the kid but not the idea of him running a place where he was not old enough to go into the bar, especially when its nightclub was downtown’s hottest. They lured him away by offering him a better salary and a manager position at their Taco Time on Division. At one time, Omni had a big operation in Spokane. They owned Casablanca, all the Taco Times, Fuddrucker’s and The Rocking Horse Saloon. Ryan became a key team player they moved around to run other local Taco Times for a few years. Then they sent him to California to open a new Fuddrucker’s before coming back to open and manage their new Spokane Fudruckers, a gourmet hamburger franchise. By the time he was 25, they put him at the helm of their starship, The Casablanca where he was in charge of four assistant managers and 95 employees. After meeting Dave Hooke at a golf tournament, Ryan decided it would be better to raise is two young boys on fast food. The plan was that he would be allowed to buy into Dave’s local franchise, Senor Froggys, a move designed to help fund Dave’s retirement and secure one for himself. That was 23 years ago and things have progressed nicely, with Ryan owning the Valley and Indiana Froggy’s. The nice progress has come through a battle of wits and hard work against difficulties like relentless national competition, an abysmal economy and a traffic shift that did not work in his favor. Ryan has kept his Froggys hopping by using two key strategies. One of the strategies was cutting edge when he became a Bruchi’s franchisee and co-branded it together with his two Senior Froggy’s 11 years ago. He was the first in Spokane to implement this nationwide trend, offering two original Spokane franchises in one location. Beyond menus that complimented each other, Ryan and Bruce Greene, founder and owner of Bruchi’s worked well together, having known each other from the Casablanca days when Bruce was an assistant manager under Ryan. Currently, they are partners in the new Cheney Bruchi’s and up until January, Ryan ran the North Town and Valley Mall Bruchi’s. Knowing a year in advance that he would be loosing his lease at the malls, Ryan took the co-branding concept to the next level, coco-branding, and brought in Itallalian Express, another local franchise that had been started by Dave Hooke with recipes provided by Luigi’s owner, Marty Hoberg , who had been one of Ryan’s busboy at the 1881 Room. The second strategy Ryan has implemented is himself. He will tell you he believes he has been at the same location for 23 years because they deliver a consistent, quality product for a good price. While that may be true, Ryan is the one who has ensured those standards day in, day out. He is hands-on and works everyday, 40 hours a week. 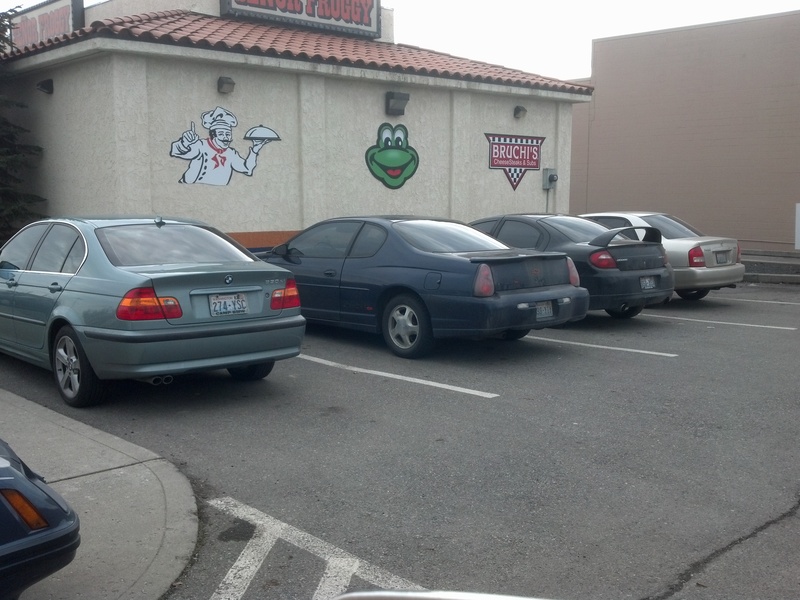 When you combine that work ethic with a 1st-chair talent for playing to a room full of diners, The Froggie is going to make it even in the rough waters of the Spokane Valley fast food pond. 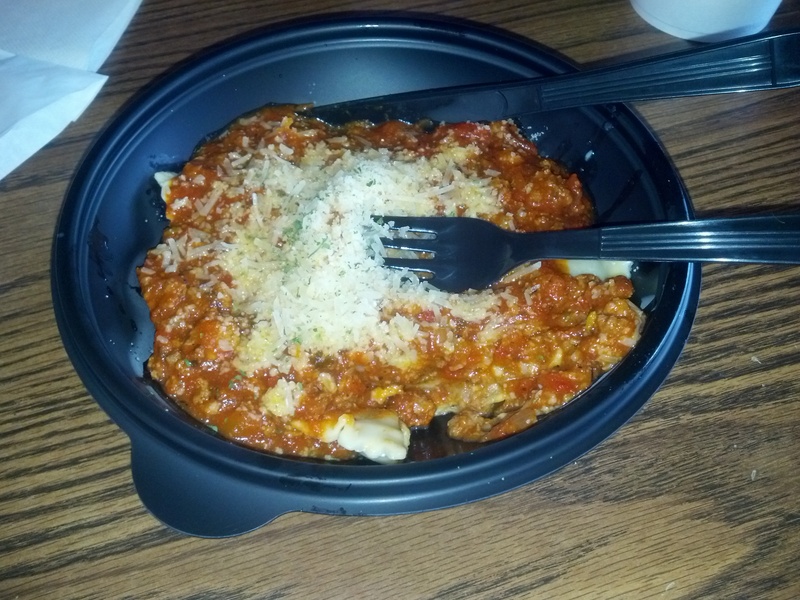 When I took Mom to lunch there the other day, he took our order at the counter and delivered the meal. It occurred to me how unusual it is at a fast food place for anyone, let alone the owner, to bring the food out even though it seems like a pretty simple but accommodating service to provide. I guess that it is something that only an owner who enjoyed working with his crew and serving his customers would be happy to do. I would imagine most owners would not enjoy either. I could tell Ryan, however, is the oddball and is happy to be doing what he was doing and to be where he is at. As I sat looking up at him from my chair as he cheerfully cleared our table, I recognized that look of contentment on his face from forty years before and I knew it was genuine. I have no problem vouching for their raviolli. They also offer it with alfredo. 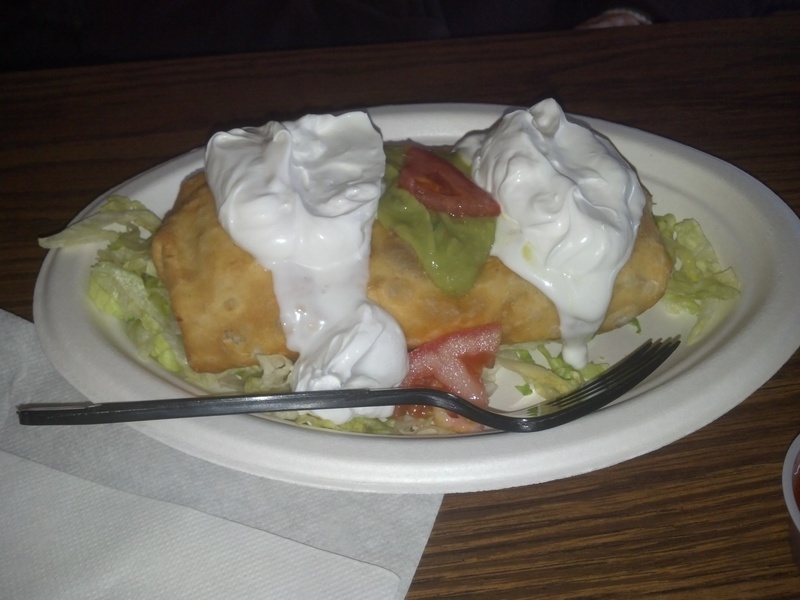 Mom will have to vouch for their chimichanga. It must be good because she has been eating this at Senor Froggies for years. All I know is that it looks mighty tempting. The only thing happier than that frog on the outside is the big bullfrog on the inside.